The Optimum MDR Mineral Deposit Remover will remove water based deposits from painted surfaces with ease! Parking next to a sprinkler, rinsing your car with hard water during washing, etc. can lead to hard water actually lightly etching in to the surface of your paint. MDR features a non-abrasive chemical formula that will help you dissolve these water based contaminants without polishing the surface. Put a few drops on the watermarks and then gently agitate the surface with a soft and clean microfiber towel. The combination of acids and chelating agents will break down and dissolve these marks quickly and easily. If this process is not enough you may need to polish to remove deeper etchings, but this formula is generally very effective on light to medium watermarks. Stop staring at those ugly water marks and pick up the Optimum MDR Mineral Deposit Remover today! 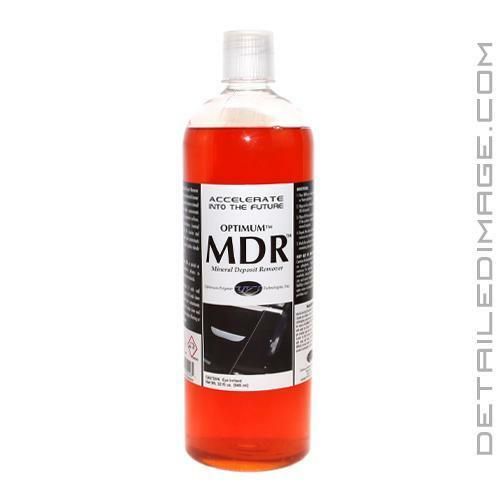 Simply wipe MDR on painted or other automotive surfaces to dissolve and remove minerals. A combination of acids and chelating agents will break down and dissolve these contaminants and make the surface clean and smooth again without affecting or removing paint. 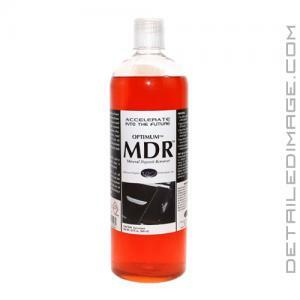 Pour MDR on a clean microfiber towel or foam applicator. Wipe on the surface and work it in for 30-60 seconds. Repeat the above steps as required to remove and remaining contaminants. I'll withhold criticism but bought it to clean home windows. First use has not removed spots but I will try it again with more elbow grease. My sister's window cleaner recommended this and he is younger (stronger) so I will give it one more try. I have a lot of windows, some more spotted than others. I'll follow up. Works well to keep Optimum Gloss Coat clean - but you have to clean surface FIRST with Optimum Paint Prep (the normal suggested cleaner for Gloss Coat) before using Mineral Deposit Remover. On first use I did not do this and had less than stellar results from MDR. Tried again a few days later by cleaning Gloss Coat first with Paint Prep, then using MDR, then cleaning residue with Paint Prep again - worked great - ALL water spots gone and restored high shine / hydrophobic surface - bug residue just wipe away easily from renewed surface. I use Wolfgang Uber Rinseless Wash, or ONR as maintenance, but step up to Paint Prep to deep clean and renew surface. Add MDR when I have water spots to remove. Using Paint Prep and MDR does not degrade Gloss Coat - quite the contrary, it makes the surface look like it has been newly coated. If you have Gloss Coat then Paint Prep and MDR are your friends! Used this product to remove water spots from front fenders hood and front grille. Worked great and did not remove wax. Finish clean up was perfect, a little product goes a long way.